Sarah Casey (18) lines up a shot as Kristen Landry (17) and Emily Schille (15) defend. 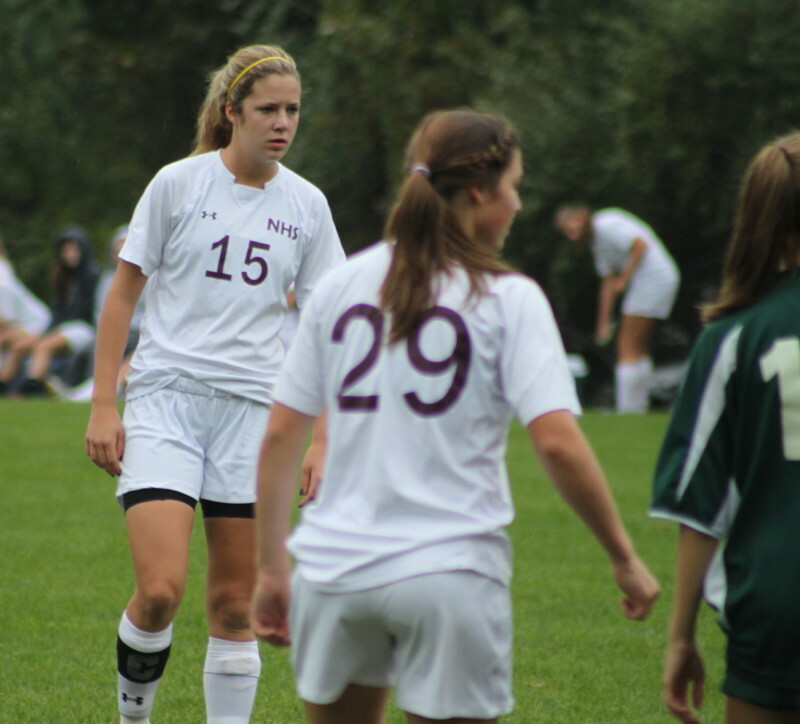 Sarah scored the third Newburyport goal in the first half. 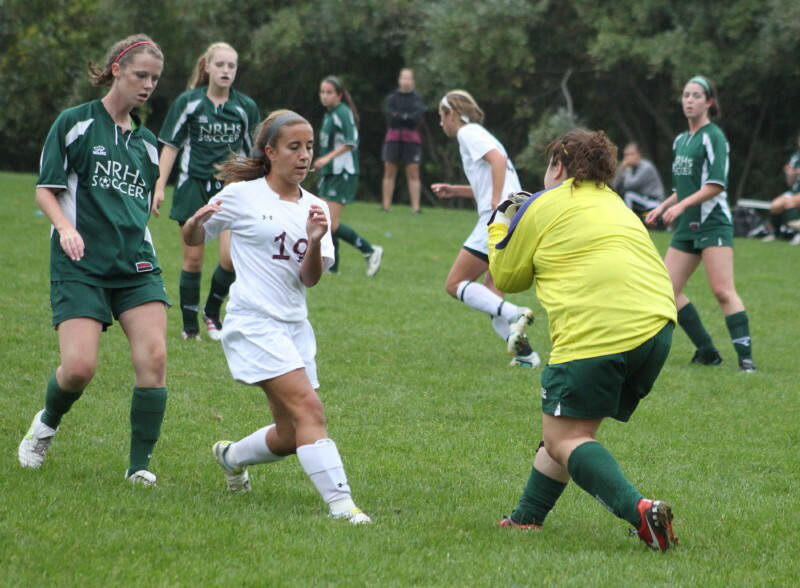 (Newburyport) The Clipper soccer girls easily defeated North Reading, 5-0, on Thursday afternoon at Cherry Hill Field in a Cape Ann League game. 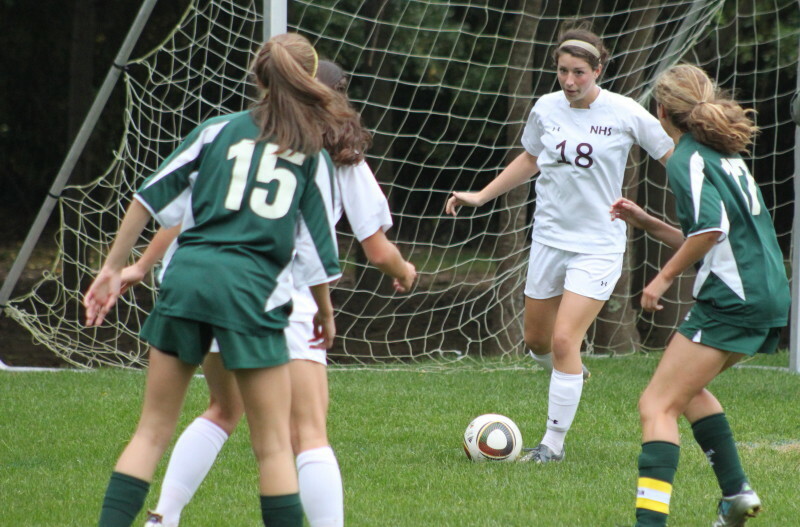 Hannah Martin (15) scored the first Clipper goal. Watching what I saw of the game (first half), it was hard to imagine that the Hornets (3-3) had only lost 1-0 to Newburyport (6-1) on September 13th at North Reading. There was very little time spent in the Newburyport end. Clipper goalie Lily Donovan was not tested, in fact she never touched the ball. Hornet advances into the other end were long range or down the sidelines. Good scoring chances never happened. I saw only half of the game because it started raining near the end of the half. I got under the trees hoping the rain would end. I heard the rumbling of thunder at halftime and headed home. NHS led, 3-0, at the time and I was quite confident that I would read in the Newburyport Daily News that they had won…..and they did. The Clipper threats started early in this one and never stopped while I was there. A Hornet hand ball set Hannah Martin up for a direct kick in the first minute. The CAL All-Leaguer’s shot hit the top crossbar. Carly Brand (11) dribbles toward the net with teammate Maryam Moshrefi (21) nearby. Both girls scored goals in the 5-0 victory. Hannah finally scored at the 16-minute mark as she took a pass from Jaycie Triandafilou on the left side and fired a left foot shot over the head of NR goalie Miss Patalano. Fourteen minutes later Hannah used another direct kick to set up teammate Carly Brand for goal #2. With less than two minutes left, the ball got into the box from the side and Sarah Casey came down the middle and kneed the ball into the net for Newburyport‘s third goal. 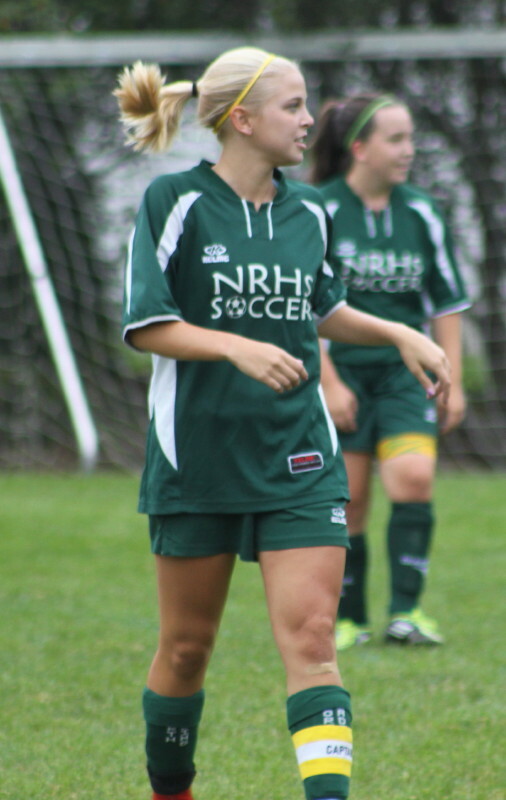 North Reading’s returning CAL All-Leaguer, Jessie Valenti, was at the game but I don’t think she played…..at least in the first half. There was only one ball girl available. That had NHS coach Robb Gonnam retrieving shots off the bench side that went into the woods. I am sure this wasn’t part of his game strategy! This was my first look at the Clippers and they looked awfully good at least in this half. Hannah Martin controls the center of the field and was very dangerous on direct kicks. Alyssa Leahy controlled the deep third of the field. Nicole Galer was elusive with the ball – several times defenders ran at her and she just pulled the ball away and moved on. These girls were all Cape Ann League award winners in 2010. Clicking on the pictures enlarges them to normal size. Jaycie Trianafilou (19) looks for a rebound from NR goalie Missy Patalano. 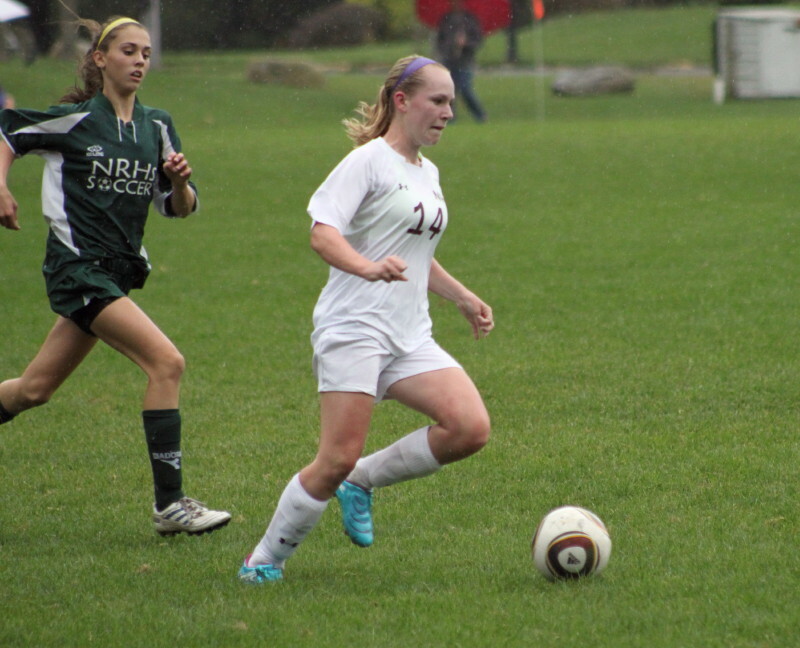 Amy Sullivan dribbles toward the North Reading net.